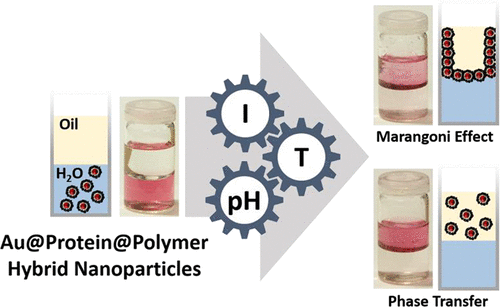 In this study, we present a novel and facile method for the synthesis of multiresponsive plasmonic nanoparticles with an interesting interfacial behavior. We used thiol-initiated photopolymerization technique to graft poly(N-isopropylacrylamide) onto the surface of protein-coated gold nanoparticles. The combination of the protein bovine serum albumin with the thermoresponsive polymer leads to smart hybrid nanoparticles, which show a stimuli-responsive behavior of their aggregation and a precisely controllable phase transfer behavior. Three interconnected stimuli, namely, temperature, ionic strength, and pH, were identified as property tuning switches. The aggregation was completely reversible and was quantified by determining Smoluchowski’s instability ratios with time-resolved dynamic light scattering. The tunable hydrophobicity via the three stimuli was used to study interfacial activity and phase transfer behavior of the nanoparticles at an octanol/water interface. Depending on the type of coating (i.e., protein or protein/polymer) as well as the three external stimuli, the nanoparticles either remained in the aqueous phase (aggregated or nonaggregated), accumulated at the oil/water interface, wet the glass wall between the glass vial and the octanol phase, or even crossed the oil/water interface. Such smart and interfacially active nanoparticles with external triggers that are capable of crossing oil/water interfaces under physiological conditions open up new avenues for a variety of applications ranging from the development of drug-delivery nanosystems across biological barriers to the preparation of new catalytic materials.